Pops color to any outfit! 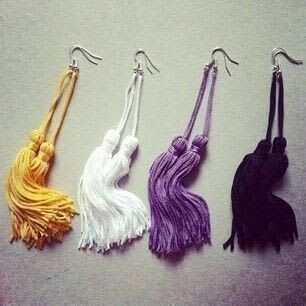 https://www.cutoutandkeep.net/projects/chinese-knot-tassel-earrings • Posted by Shirin L.
I used earring hooks, and multicolored Chinese knotting cord tassels to create these earrings. Just attached the end of the tassel to the o-ring of the earring hook. It only takes a couple of minutes to make a pair of these fabulous earrings that go swish as you turn your head.